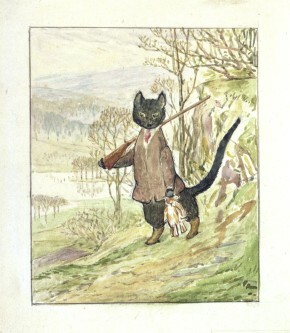 Cats feature in several of Beatrix Potter’s best-loved tales. Tabitha Twitchit and her cousin, Ribby, are models of respectability but Tom Kitten is prone to scratching and the tailor of Gloucester’s cat, Simpkin, spits and growls – ‘I don’t consider cats thoroughly domesticated animals’. When the young Peter Rabbit encounters a white cat flicking his tail in The Tale of Peter Rabbit (1902) he keeps his distance (he had ‘heard about cats from his cousin, little Benjamin Bunny’), yet in another story an older and stouter Peter Rabbit outwits a cat and leads it straight into the clutches of the treacherous Mr. Tod. But this story was never published. Following her marriage in 1913 Potter began work on a new story ‘about a well-behaved prim black Kitty cat, who leads rather a double life.’ At night, Kitty dresses in a ‘gentleman’s Norfolk jacket, and little fur-lined boots’ and slips out of the window to hunt game with an air gun. By March 1914 Potter had drafted the story and begun ‘several drawings’. The first draft required ‘compressing’ but Potter assured her publisher, Harold Warne, that the story had ‘plenty of variety’ and would ‘illustrate very well’. Unfortunately, persistent poor health and the death of her father in May prevented consistent work on the book. Despite her efforts, Potter is known to have finished only one watercolour, and pencil annotations on the printed slips of text pasted into her dummy book for the story suggest that even the galley proof was not her intended final version of the story. What little we know about The Tale of Kitty-in-Boots we owe to the Potter scholar and enthusiast, Leslie Linder (1904-1973). In the 1950s Linder amassed a huge collection of her drawings and manuscripts, including three manuscripts of the story of Kitty-in-Boots, the dummy book containing cuttings from the galley proof of the text, an unfinished drawing of Mr. Tod peering at Kitty over the ‘mossy tumble down wall’ and the only known finished illustration, believed to be the frontispiece. (The V&A holds another preliminary drawing for the story on long-term loan from Frederick Warne.) Prior to bequeathing his collection to the Victoria and Albert Museum in 1973 Linder exhibited a manuscript of Kitty-in-Boots in the Beatrix Potter Centenary Exhibition at the National Book League, London, in July 1966. He went on to publish the text of the story of Kitty-in-Boots in A History of the Writings of Beatrix Potter (Frederick Warne, 1971), still the only comprehensive compendium of Potter’s fiction. The finished frontispiece illustration has been reproduced several times, in particular in the published catalogue of the Linder Bequest, Beatrix Potter: the V&A Collection (1985). We know that Potter began ‘several drawings’ for the tale of Kitty-in-Boots yet, until now, only one finished drawing and two rough sketches have come to light. Shortly before the recent announcement of the forthcoming publication of The Tale of Kitty-in-Boots (with illustrations by Quentin Blake) by Frederick Warne & Co. the V&A was approached, coincidentally, by a family looking for information about a couple of drawings they believed might be by Beatrix Potter – they even suspected one to be an illustration for The Tale of Peter Rabbit. In this particular drawing Peter Rabbit wears his familiar shoes and blue jacket with brass buttons, but the character in the background is unmistakably Kitty-in-Boots. 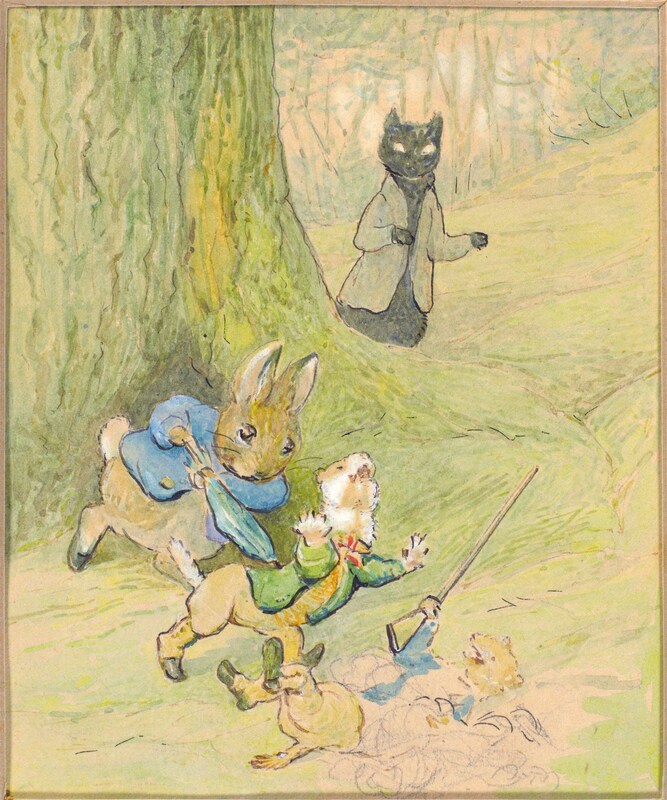 The scene depicted in the illustration occurs about halfway through the story: ‘Slimmy Jimmy suddenly came out of a burrow, pursued by a stout buck rabbit in a blue coat, who was prodding him violently and painfully with an umbrella. They upset John Stoat Ferret who was waiting outside with the net; and before he could pick himself up, Miss Kitty had seized the gun.’ The drawing’s provenance suggests that several more illustrations for the story of Kitty-in-Boots may exist after all. It also offers a tantalising glimpse of the story as Potter intended it and places The Tale of Kitty-in-Boots in the canon of Peter Rabbit books. Familiar characters appear alongside Kitty in the text – including the treacherous Mr. Tod and comical Mrs. Tiggy-winkle – but in this illustration Potter reintroduces her best-loved character, Peter Rabbit – perhaps just a little older and fatter. The setting of the story is the Lake District and, typically, Potter has completed the background of the illustration before introducing the characters. Peter Rabbit and Slimmy Jimmy show Potter at her best but there is a problem with the illustration: did Potter forget that the story takes place at night? Nevertheless, Potter possessed a genius for visual and verbal storytelling. It has always been mystifying that in a story peppered with unusual and eccentric names (Kitty has several, including Squintums and Miss Catherine St. Quintin) Potter never reveals the name of the ‘stout rabbit in a blue coat’. Of course, the clues are there in the text but now we know that Potter intended to reveal the rabbit’s identity in the illustrations. Potter constructed immersive, playful and compelling narratives through the subtle interplay of text and image. In The Tale of Kitty-in-Boots she intended to involve young children in the narrative process by providing visual clues to textual ambiguities. With her instinct for knowing what children like, Potter devises an ingenious game in which pre-reading children can discover for themselves the identity of the mysterious rabbit with the umbrella. The unpublished drawing of Kitty-in-Boots will be on display from 2 – 31 May 2016 in Gallery 102. I am planning visiting the Beatrix Potter ‘Kitty in Boots’ display tomorrow, but I’m not sure if I need to book or if there is a charge. 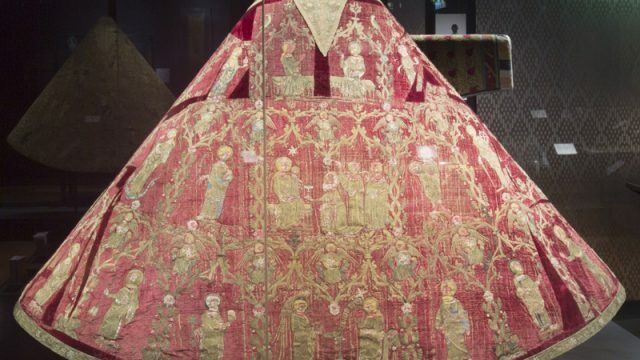 Apologies for overlooking your comment – I do hope you managed to see the display – as you will have discovered, there was no charge and no need to book. My youngest brother organised for me for Christmas a copy of Kitty In Boots. Is there any clue which St.Quintin Beatrix had in mind when she gave Kitty the name ‘Miss Catherine St.Quintin’? We are not numerous, so it has been a wonder to meet our name in the book! Can you suggest a course of research to locate this information, as we are intrigued?